Consulting derived from real world experience and expertise cumulated from a results oriented customer service approach is VoIP Citadel. We have seen the results and, unfortunately, routinely repair the results of VoIP gone wrong. Consisting of seasoned, veteran asterisk consultants in Tacoma, Washington & Scottsdale, Arizona, VoIP Citadel has a proven track record established through implementation, repair and management of VoIP installations. Whether you have an Enterprise Sized Call Center in Seattle or a 5 seat office in New York, contact us today to see if we can help solve your VoIP problems! VoIP Citadel specializes in support, implementation, upgrades, repair and maintenance of FreePBX, PBX in a Flash, Thirdlane, and most other open source Asterisk based PBXes. 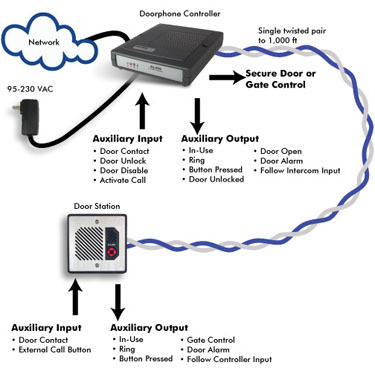 The Algo 8028 doorphone is an weatherproof/outdoor rated SIP intercom, designed to allow users of your Asterisk PBX to control access through a secured gate or door with the simple press of a button. When a visitor presses the back-lit call button a single phone or a group of phones will be rang in the office. Once answered the occupants of the building are able to verify identity courtesy of the two-way communication with the visitor, after which they can dial the access code thereby granting the visitor access to the premises. 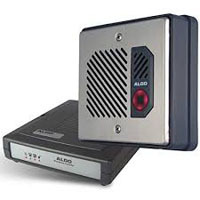 The doorphone can also be dialed directly from any user on the system to communicate with the visitor. If you would like additional information about installing a Algo Door phone or have any questions please contact us! IT services, specializing in VoIP and Asterisk. Located in the Puget Sound Region of Washington State, VoIP Citadel offers an array of IT innovations, network convergence, voice management and telecommunications solutions to the entire United States. work to ensure you see increased efficiencies in your organization based on your IP PBX's performance. If you would like to find out more, or see how we can help you please contact us today. Asterisk is stable enough to support everything from 5 seat premise based PBX's to 500+ seat fully redudant contact center applications. The most enticing aspect of Asterisk is the sheer amount of features available and the open source licensing associated with them. While more features are added with every release, licenses for items such as voicemail, extensions, and even auto-dialers are no longer necessary. Open Source VoIP has truly revolutionized the IP PBX market! Asterisk continues to embrace legacy PBX features such as DISA, custom IVR's/AA & ACD, while enhancing the value of your communications platform with features such as interactive flash based CDR's, click-to-dial applications, voicemail to email, real time monitoring, and operators transferring calls with the click of a mouse.